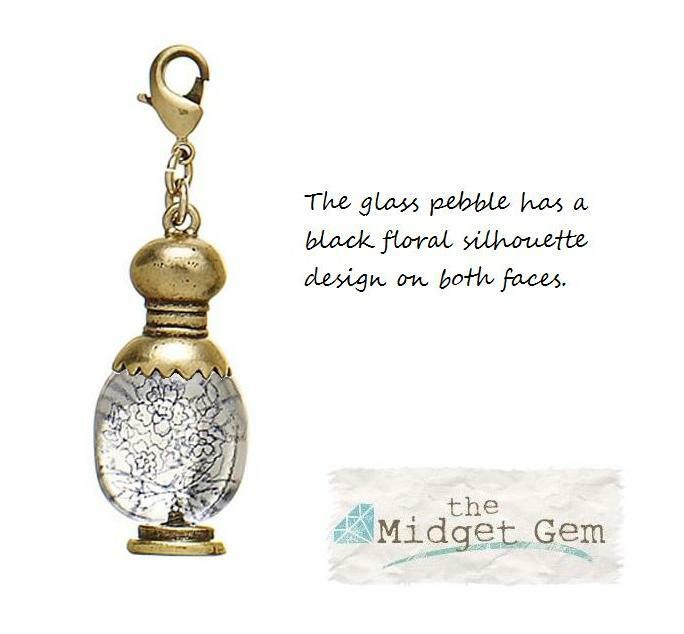 From the first season launch of the Pilgrim charm collection, a 'faux' perfume bottle, with a glass pebble insert with black floral silhouette details to both faces. 5cm/50mm in total length. Gold plate. No impressed logo. Pilgrim tag. Pilgrim 'Star Sign' charm collection, just select which one you require from the list. They measure around 4.5/5cm total length. Gold plate. Pilgrim tag. This one is called 'Eco Leaf'. 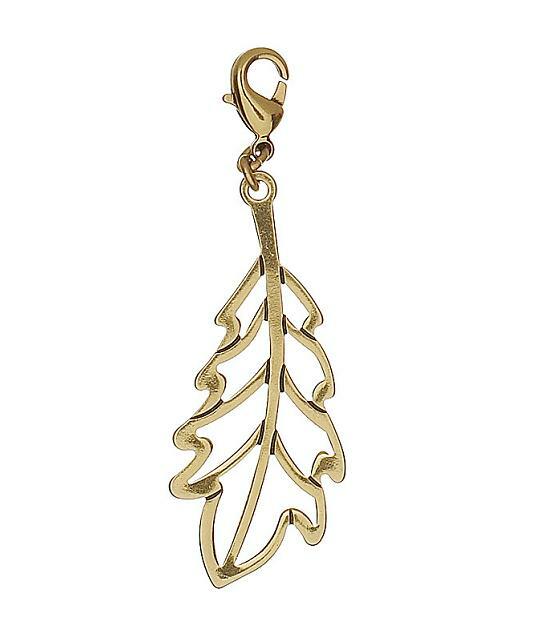 This pretty leaf outline in darkened gold plate finish, is quite flat and it works well as a background charm, in clusters of charms in necklace arrangements. It measures 6cm/60mm in total length. Pilgrim logo impressed on the back. Pilgrim tag. Pilgrim loyal heart charm. A puffed heart, a solid charm not hollow, surprisingly weighty, with a tiny crown set with clear Swarovski crystals. The crown is a symbol of loyalty and thus loyalty to the heart. In vintaged gold plate (a textured/pitted surface). 2 cm/20 mm. Total length inc. clasp 3.5 cm/35 mm. Pilgrim logo impressed on the back. Complete with Pilgrim tag. Pilgrim 'Peace' symbol charm. Pretty raised flower and foliage that has been burnished to highlight the details. Symbol measures 2.4cm/24mm diameter. Total length 4.2cm/42mm. Gold plate. Complete with Pilgrim tag. Pilgrim 'Near & Dear' oval locket charm. Hinged so it does open. 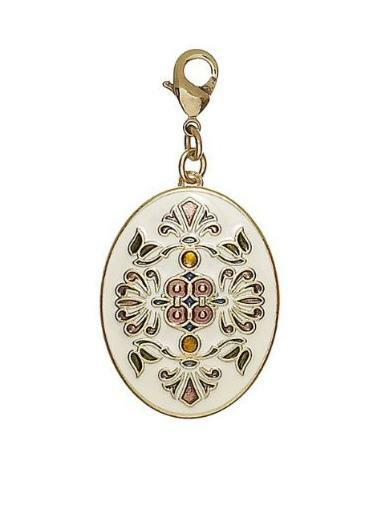 Beautiful raised floral details and enamels in cream, brown and green. Oval measures 3cm/30mm length. Total length 5cm/50mm. Pilgrim tag. 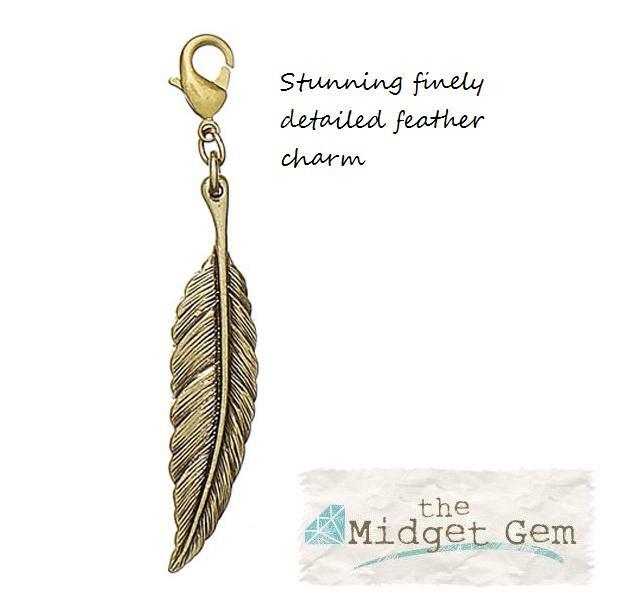 Pilgrim feather charm. Stunning detail, quite large and flat charm. Total length 7.5cm/75mm. Gold plate. Complete with Pilgrim tag. 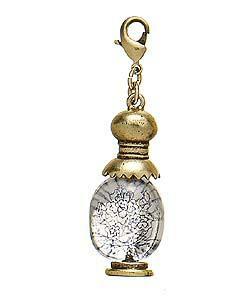 Pilgrim Amethyst drop charm. 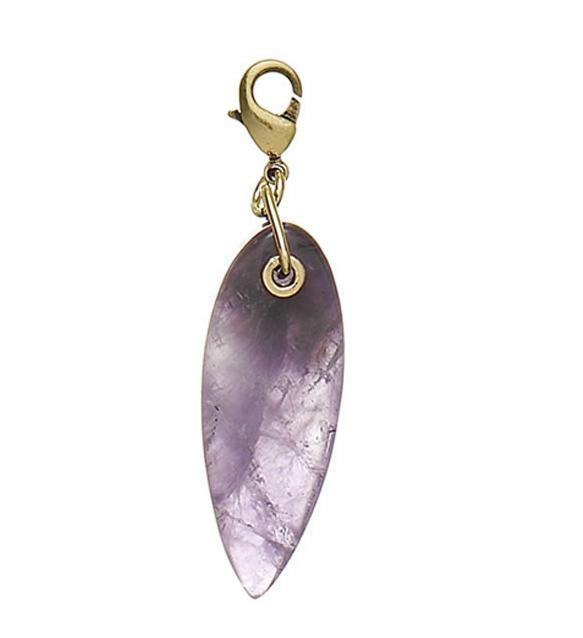 A perfectly smooth chunky drop of purple Amethyst that is wonderfully tactile and 7mm thick. The drop is slightly domed and a good weight. Looks great on necklaces. Total length 5.5cm/55mm. Gold plate. Complete with Pilgrim tag. Pilgrim 'eye' charm. Raised detail with enamelling to both sides. Flat charm. Eye measures 2.5cm/25mm widest point. Total length 3cm/30mm. Gold plate with white & blue enamel. This eye does alo have a Pilgrim logo charm which isn't pictured in their photograph? Complete with Pilgrim tag. Pilgrim 'Yin & Yang' charm. Enamelled on both sides. Flat charm. Disc measures 1.5cm/15mm diameter. Total length 3.2cm/32mm. Gold plate. Complete with Pilgrim tag.